October | 2016 | Cooking is Fun … Really!! 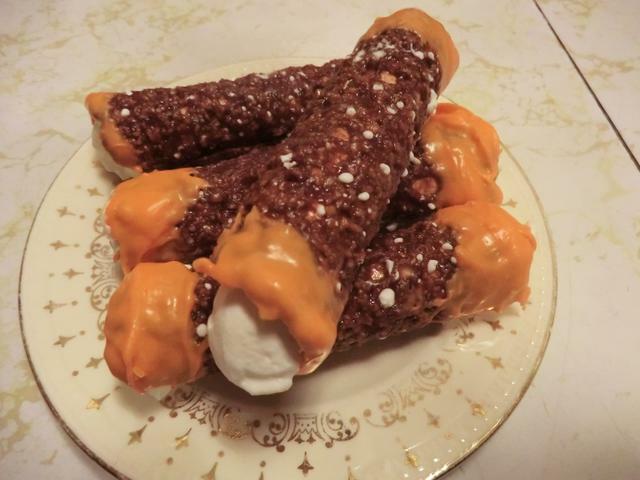 I made these adult treats filled with sweetened whipping cream for Halloween back in 2014 and since I’m not in the mood to do much new baking for the occasion this year, I thought I’d share the picture. You can find the recipe for chocolate florentines here. I know it seems like I’m a bit fudge obsessed lately but it’s the easiest sweet I can make with pantry ingredients I have right now. And, I’m still ticked off at the thought of paying $16 a pound (check Amazon if you don’t believe me) for something anyone can make at home, without a candy thermometer. And for someone who has candy making issues, that’s a strong statement. 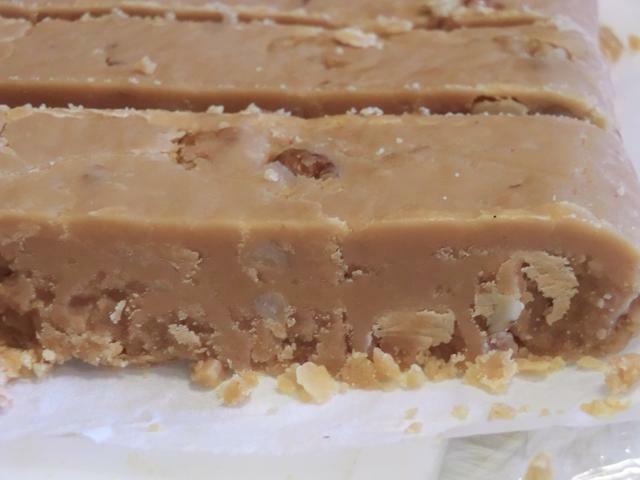 So, on Friday, I made Peanut Butter fudge. I wonder what substituting the peanut butter with Nutella would taste like? Anyone want to give this a try? Maybe just a half recipe. I know it’s not pretty but I recycled an aluminum foil loaf pan cause it was the only thing I had that was the right size. There’s a block of vanilla fudge in the picture for a colour comparison. 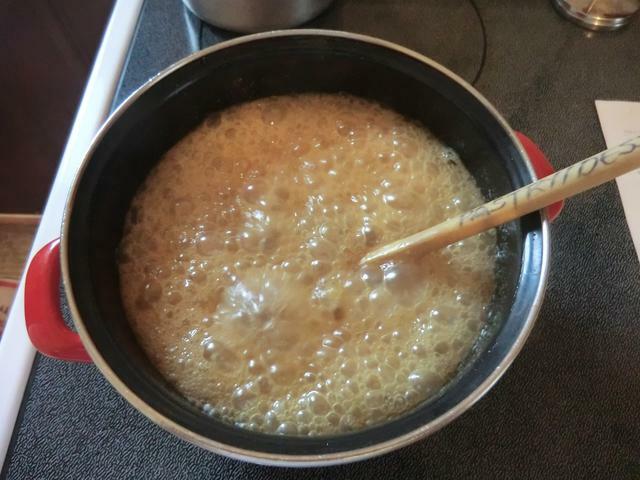 Mix brown and white sugar with the milk in large pot; bring mixture to a boil. 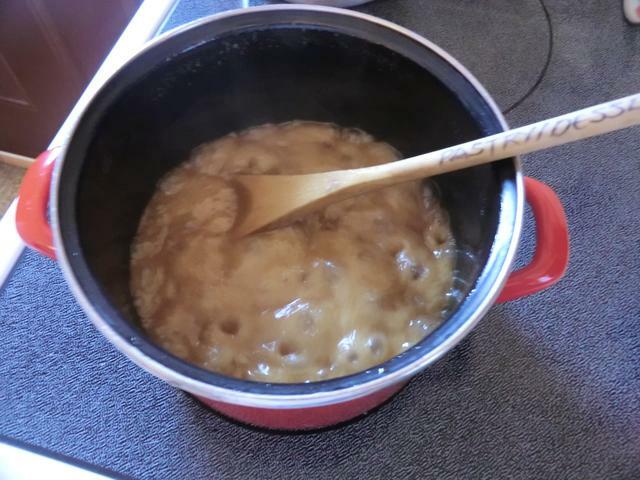 Stir in peanut butter and butter, reduce heat to medium and bring the mixture back to boil (stirring constantly). Remove the pot from the heat once the temperature has reached 115 C/239 F or the soft ball stage. Let cool for 5 min. Add vanilla to the mixture; stir vigorously until the fudge looses its glossy sheen. 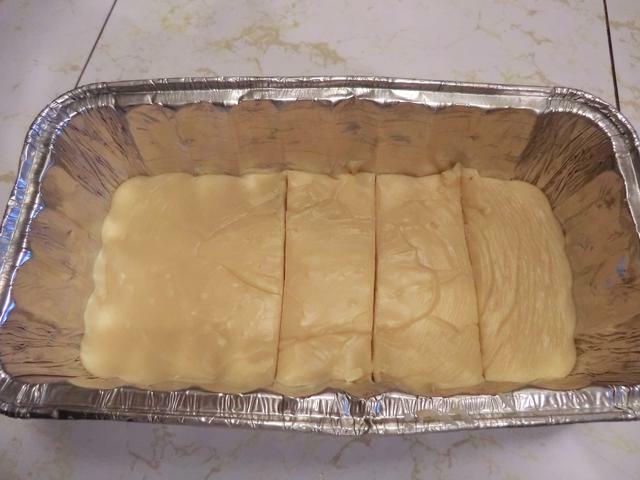 Pour fudge into a buttered 8×8″ pan. Let cool and cut into 1 inch pieces. Trial 2: (10/20/2016) Made a half batch of the original recipe. Melted ingredients at medium-high and once it started boiling, I reduced the heat to medium (5). It only took 6-7 min. of boiling to get to the soft ball stage. Stirred for a few minutes and then put the pan into a sink with an inch or so of cold water and in a few minutes more of stirring, it was thick enough to pour. Pour FAST and scrape out with firm spatula so you get most of the stuff on the sides and bottom into your pan. 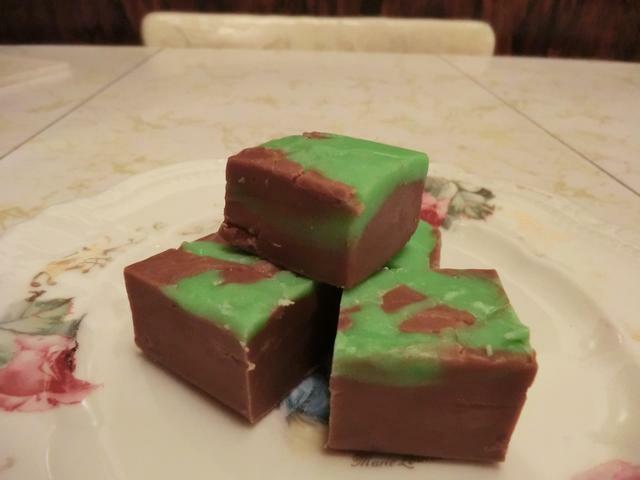 And yesterday, I made Chocolate-Mint fudge using the vanilla fudge recipe as a base. This is the best textured batch of fudge I’ve made to date. 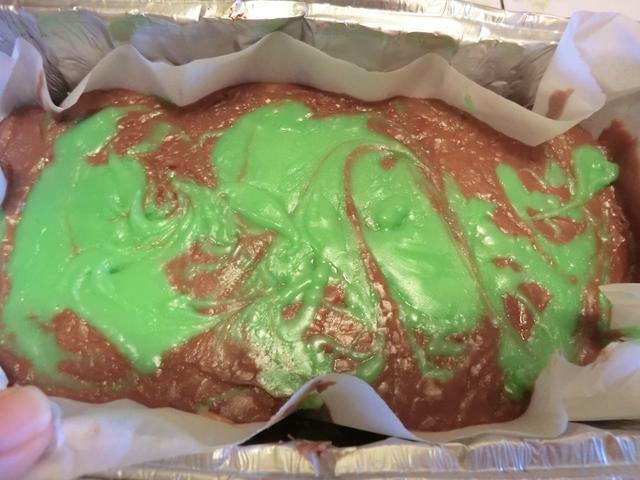 Chocolate-Mint Variation: After letting the fudge cool, for 5 minutes, I added 1 oz of finely chopped high cocoa fat chocolate to the mixture and 1 tsp of mint extract and beat it until the chocolate had melted and the fudge had lost its sheen while still being pourable. 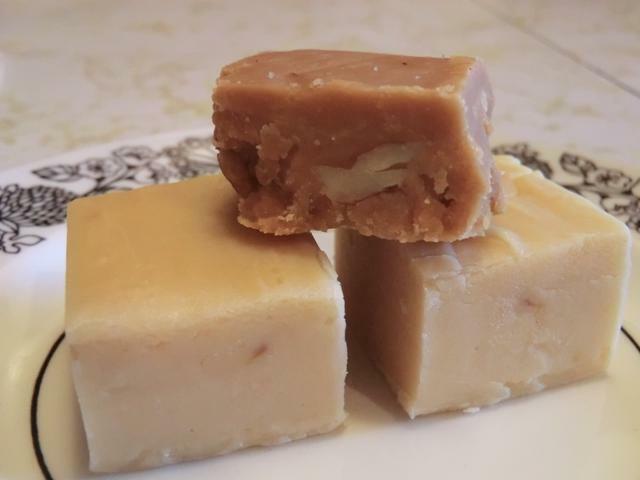 You can use the basic vanilla fudge recipe to make many variations by adding different extracts, food colourings to part or all of it, nuts or dried fruits. A Black Forest variation with well drained maraschino cherries and a pink fudge layer comes to mind. You know me, and giving up. 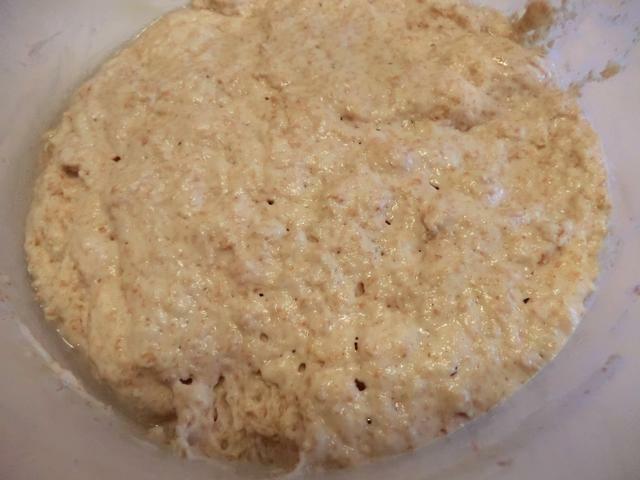 I’ve tried several ‘traditional’ sourdough recipes, since I decided to make my own sourdough starter in the summer of 2015, and met with nothing but failure. I blamed the starter, but then I had problems with the new one too … probably a case of using the starter before it was ready. I think this latest bake is pretty good. 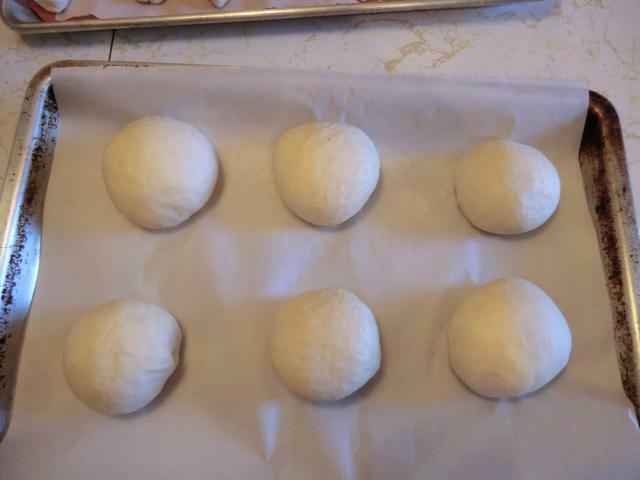 I used a recipe I found online, complete with step by step pictures of each stage. 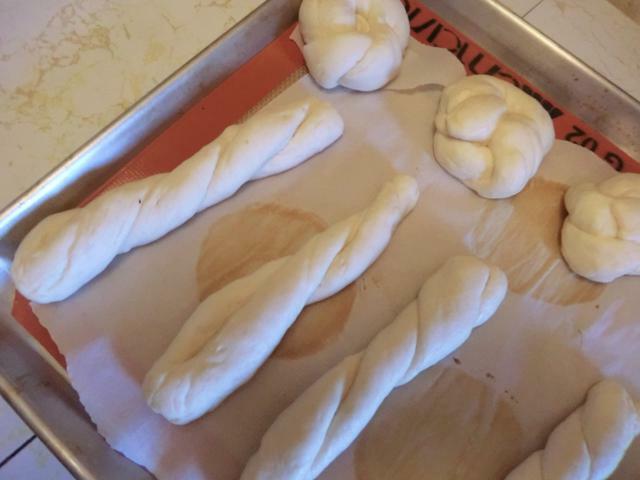 My pre-bake loaf was a bit slacker than the one in the picture. 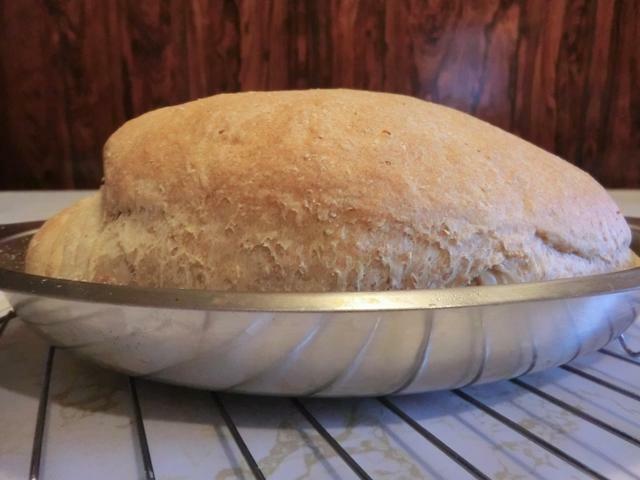 As you know, I don’t have a digital scale, just an old fashioned one that’s not very accurate so I’m sure my bread and flour amounts are off. 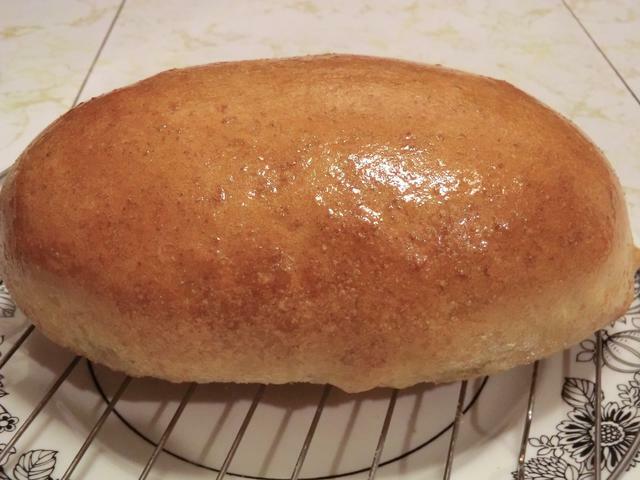 Still, I was able to produce a decent loaf. 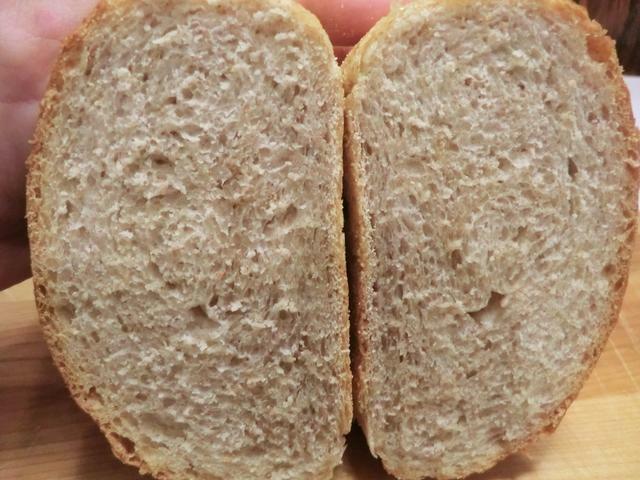 Good colour, decent rise and I think the crumb is comparable to pictures I’ve seen online. 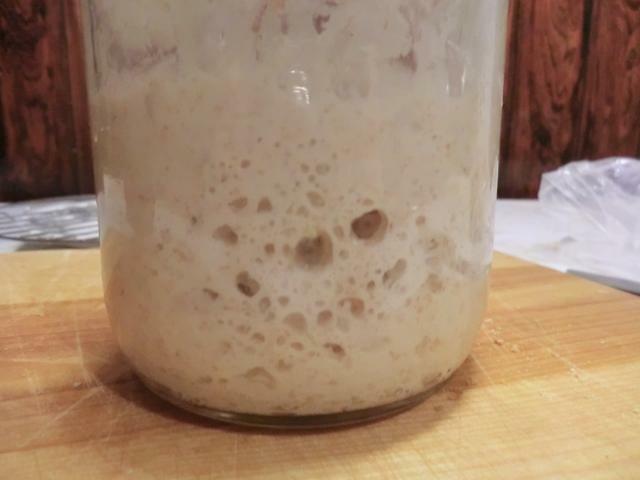 So, I fed my starter (it’s over 2 weeks old now) and tossed it in the fridge to wait until I get inspired to bake with it again. I MAY bake next weekend, I may not. I wish I could afford to buy a new scale. I should really invest in a lame or, the next best thing, a package of straight razor blades (10 for $16) but they’re luxuries at my current financial state. So, I’ll have to muddle along the best I can. No bench scraper but my offset spatula works for shaping the bread into a boule. Warning: PICTURE HEAVY POST – Please remember, the post is mostly to help me remember what I did so I can recreate or improve my efforts. Especially since often I don’t make the dishes again for a year or more. I’m happy if the research I did from various sources and synthesized here helps others too, of course. 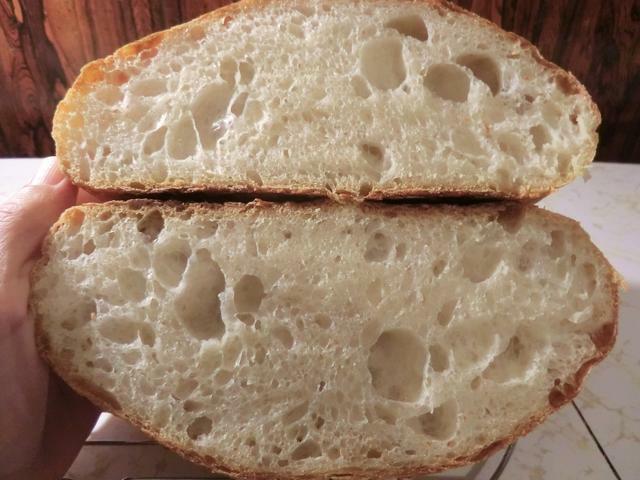 The crumb looks a bit moist and the shaping isn’t as tight and even as I would have liked. 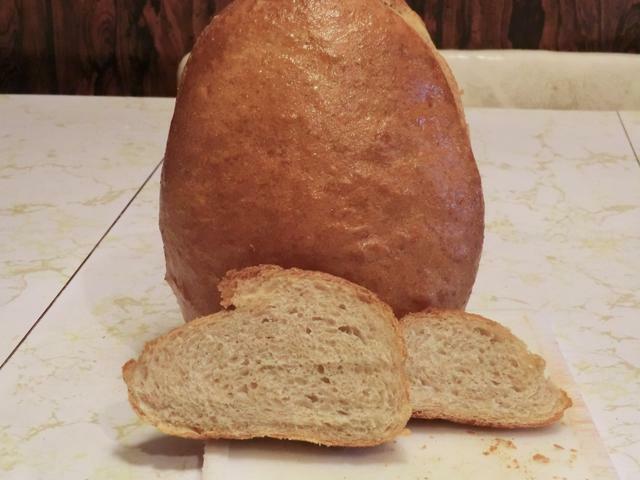 In the interest of full disclosure, I under baked the loaf by 5 minutes compared to the yeast loaf. I just wanted it to be DONE! And I cut it after 35 minutes NOT an hour so it was still warm. On the whole though, I’m pleased with my results. 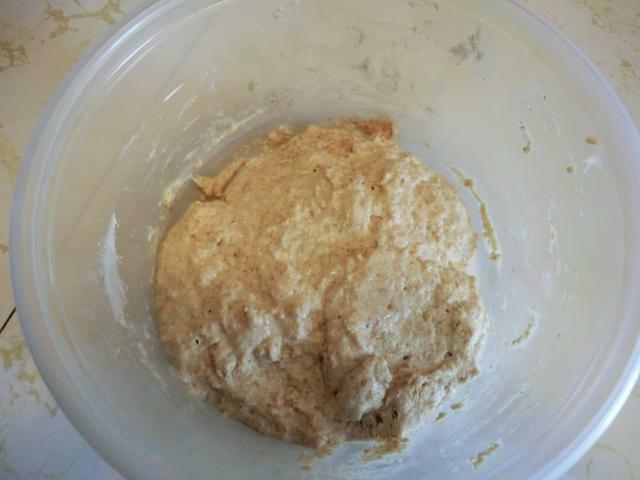 I wasn’t sure if I had enough yeast in my starter to ‘lift’ the loaf so I fed 1/2 cup of active sourdough starter with 1/2 cup of whole wheat flour and 1/4 cup of warm water. Pictures right after mixing and 1 hr later. Two hours afterwards – I tried the float test, which failed. 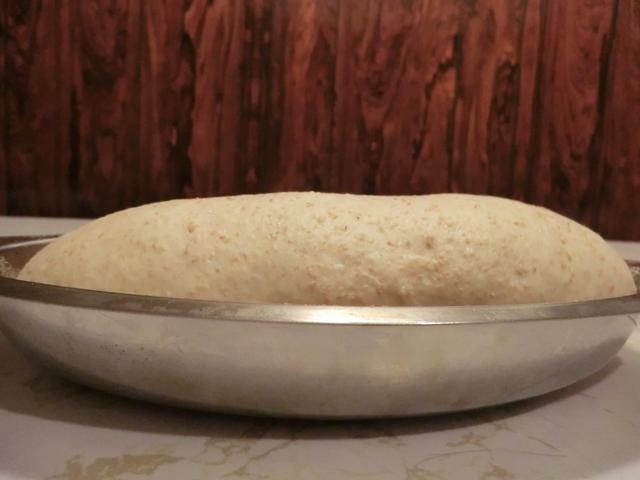 I’ve been advised that with such a thick/stiff starter, that bit of dough would never float. 2. 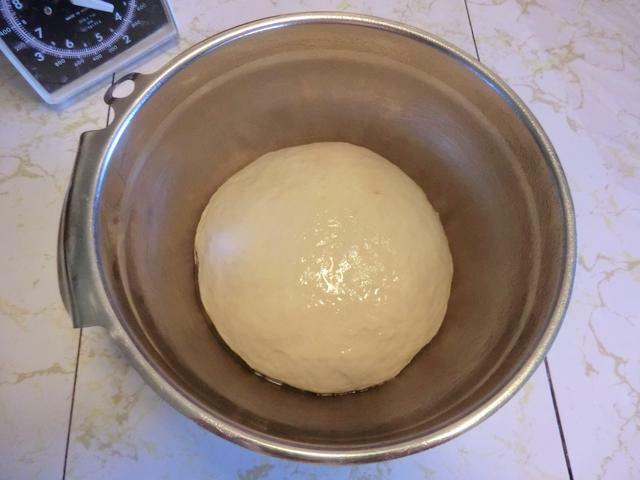 First rise or Bulk proofing – It should double in size before being shaped … I think it did. 3. Shaping – I didn’t take my time with this and seal the roll so it’s a bit uneven. 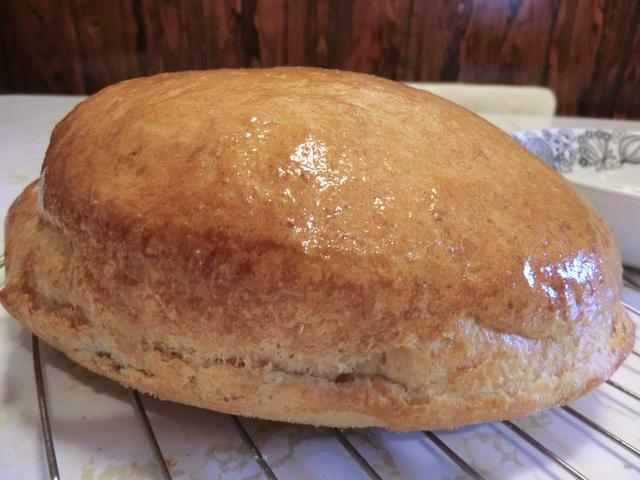 The finished loaf brushed with melted butter and allowed to cool until room temperature. Mix well in a bowl and place into a warm place (microwave with a measuring cup with 2 cups of very hot water in it) for 2 hrs. In a small bowl, dissolve the salt and honey in warm water. Add the warm water, honey and salt mixture to the sourdough mixture and stir well with a wooden spoon until it’s well incorporated. Stir in about 1/4 cup of bread flour and beat gently. Keep adding the flour until the batter gets too thick to stir and forms a ball around the wooden spoon. Transfer to a lightly floured working surface and knead using as much flour as you need to get a smooth and supple dough, about 10 minutes. Let rest for 5 minutes covered with a large bowl then knead for another 5 minutes. 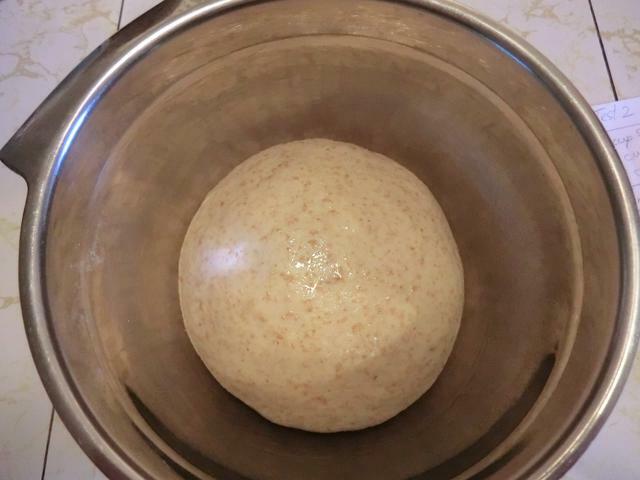 Transfer to an oiled bowl, cover with a sheet of plastic wrap and a towel and let rise until doubled, 45 minutes to 1 hour. 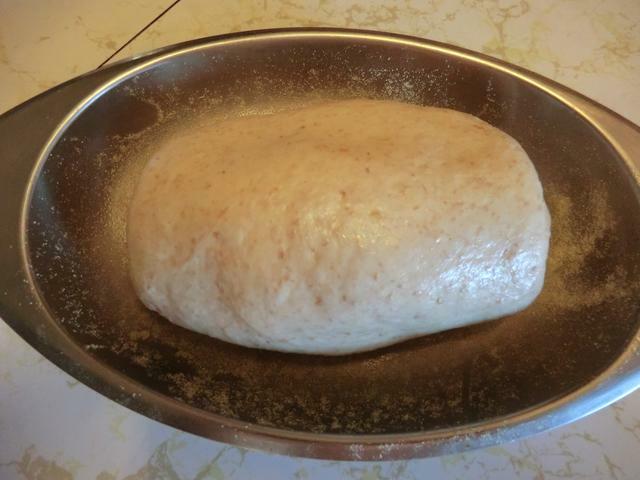 Transfer the risen dough to a lightly floured work surface and shape into a loaf. 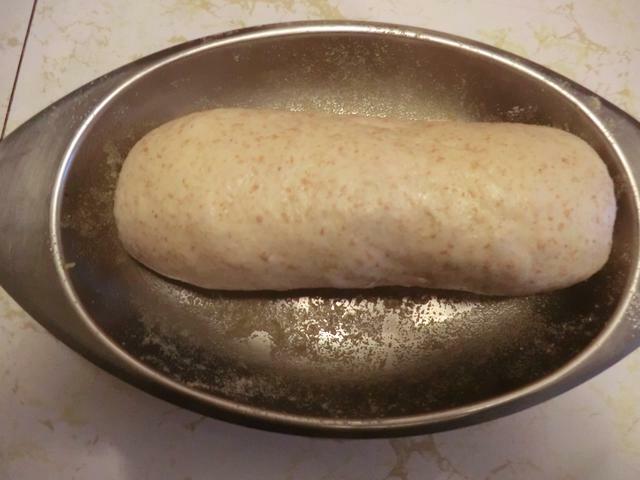 Place on a prepared baking sheet or in a loaf pan and let rise until doubled. 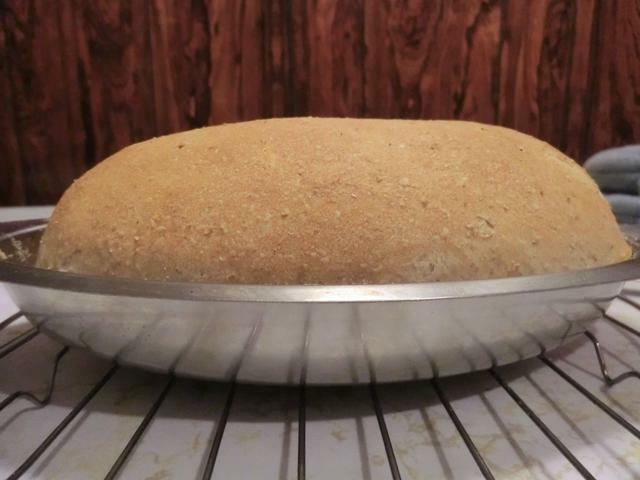 Preheat the oven to 375 deg F.
Bake for 30 minutes, take out of pan, and bake directly on the oven shelf for another 5-10 minutes or until the bottom is golden brown and when rapped, the loaf gives a hollow sound. Spray top with water after placing in oven and a second time 5 minutes later. 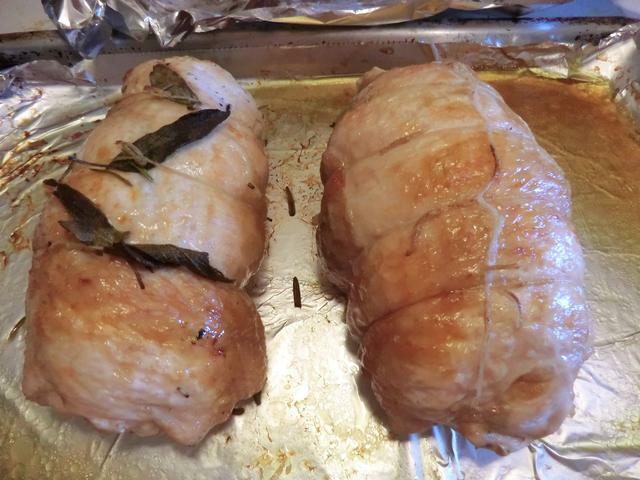 Brush the top with melted butter after removing from the oven. Let cool to room temperature before cutting. WARNING: PICTURE HEAVY POST … I split the one I was going to post in 2 but there are still a lot of pictures as I’m a visual learner/teacher. 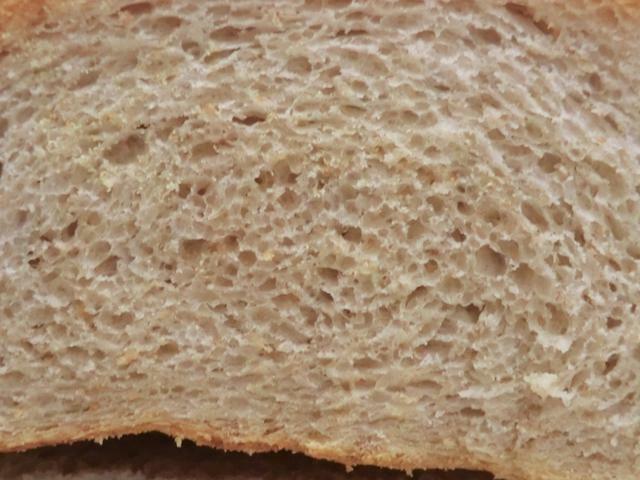 I have to admit that I don’t actually care for the taste of sourdough bread. I don’t DISlike it but it’s not something I prefer. 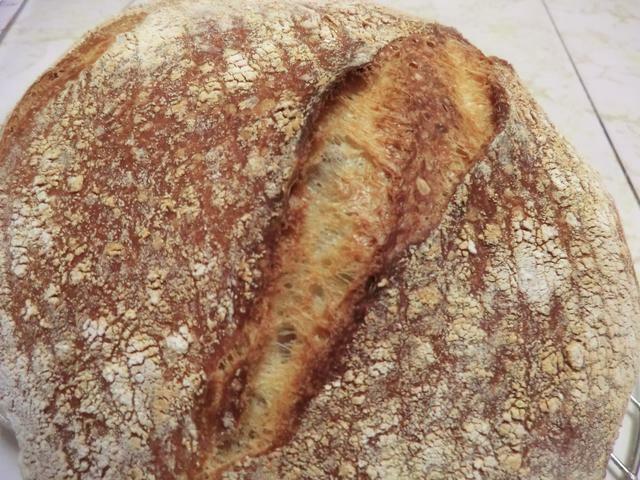 However, making a tasty and attractive loaf of sourdough bread is on my cooking bucket list, even if it’s only the mental one. 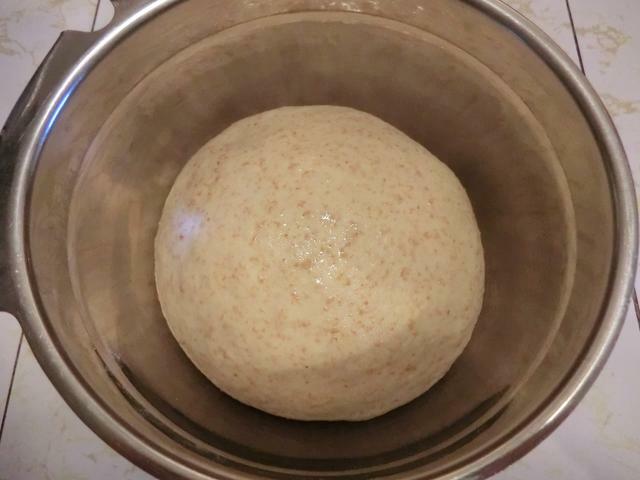 So, I’ve set out to figure out what I need to do to succeed starting with making a sourdough starter from scratch. To date, I’ve made two sourdough starters. One with all purpose flour and water and, most recently, one with whole wheat flour and unsweetened canned pineapple juice. Time is important. 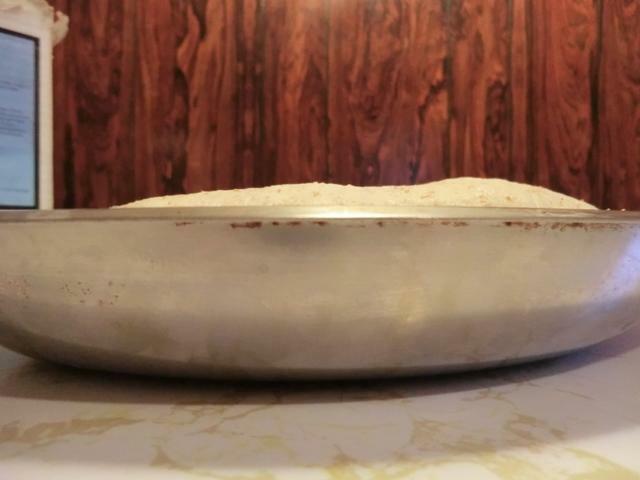 It takes at least 2 weeks of feeding for the balance of yeast and bacteria to adjust and turn a neutral flour mixture into one with the proper pH balance to sustain the right kind of yeast. And there’s no substitute for time. Don’t let that early bubbling and rising fool you after day 4 or 5. 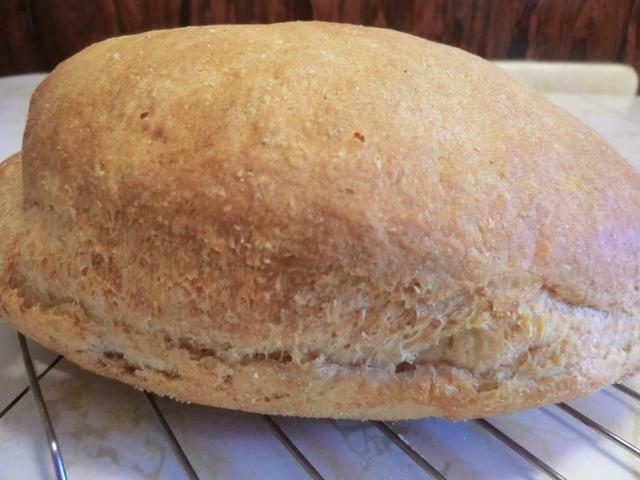 It’s NOT ready yet to substitute for yeast in your bread baking. It’s fall and the house temperature is set to 70 deg F so I’m doing all my proofing in a microwave with 2 cups of hot water to provide as optimal a rising environment as possible. 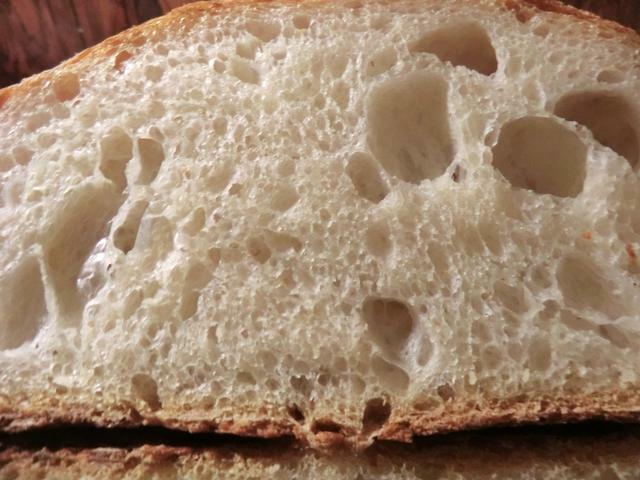 In this post and the one following, I’m going to try to replicate a honey whole wheat (33%) and all purpose flour bread made with yeast, and a touch of starter for flavour with an all sourdough starter. 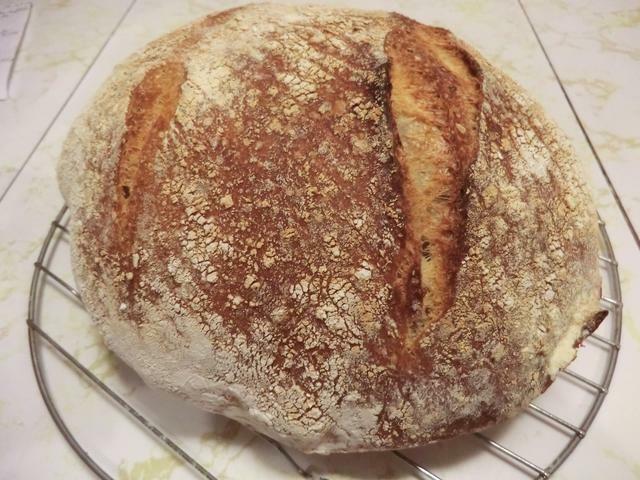 There’s more whole wheat flour in the all sourdough starter loaf than in the yeast version as my starter is mostly whole wheat and my secondary addition of flour (bread only) didn’t end up needing as much flour to get a nice, soft dough. Shaped, proofed for 1 hr and baked for ~40 minutes at 375 deg F.
In a small bowl, mix together the warm water and honey until the sugar is dissolved. 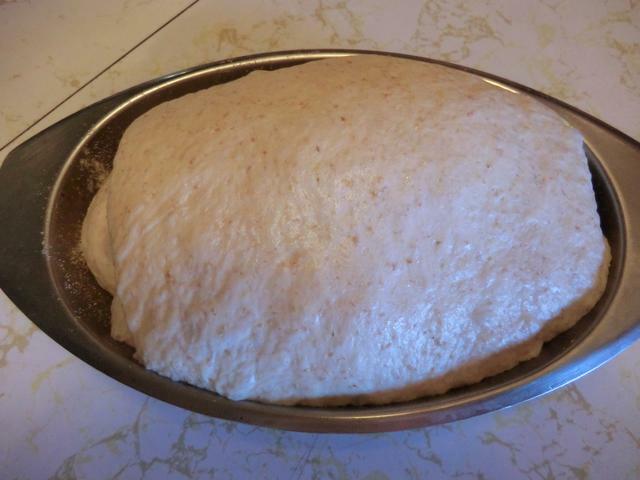 Add the yeast, stir and let rise for 10-15 minutes until the mixture is foamy. 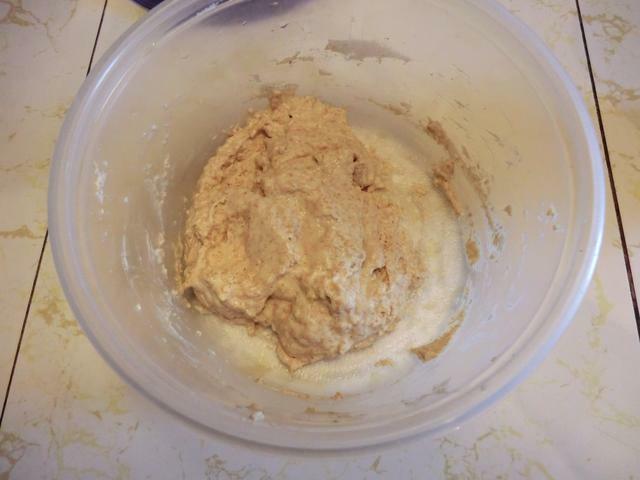 In a large bowl, combine the 1/2 cup whole wheat flour, 1/2 cup of all purpose flour and salt. 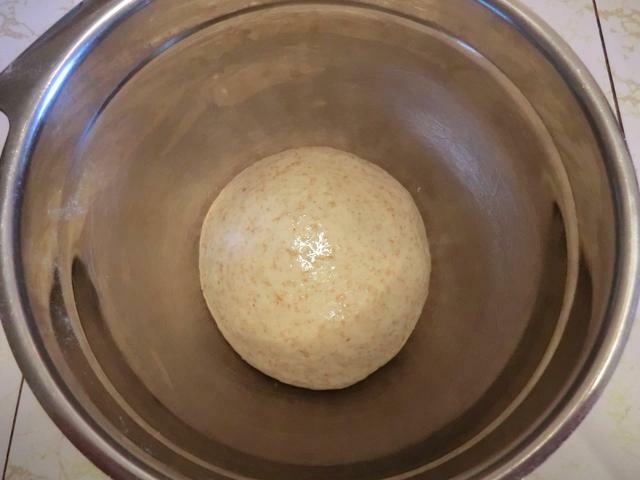 Stir in the yeast-honey mixture and the starter with a wooden spoon and beat until you get a nice smooth batter. Gradually stir in another 1/2 cup of all purpose flour until the dough gets too stiff to stir and forms a ball around the spoon. 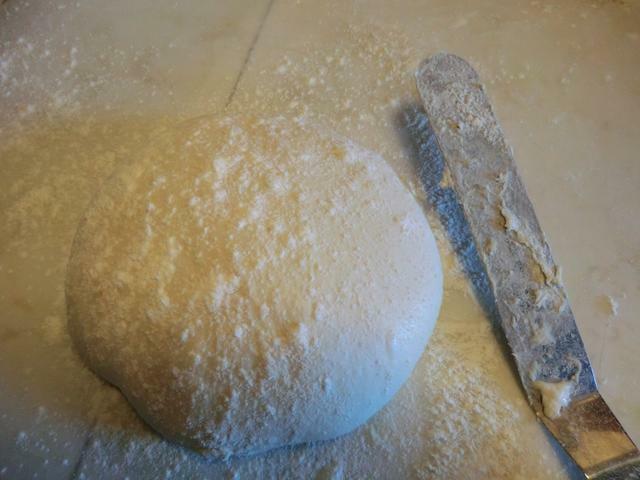 Transfer the dough to a lightly floured working surface. Knead for 10 minutes using the reserved flour and as much more flour as need until you get a nice smooth and supple dough. Let rest for 5 minutes covered with a large bowl then knead for another 5 minutes. 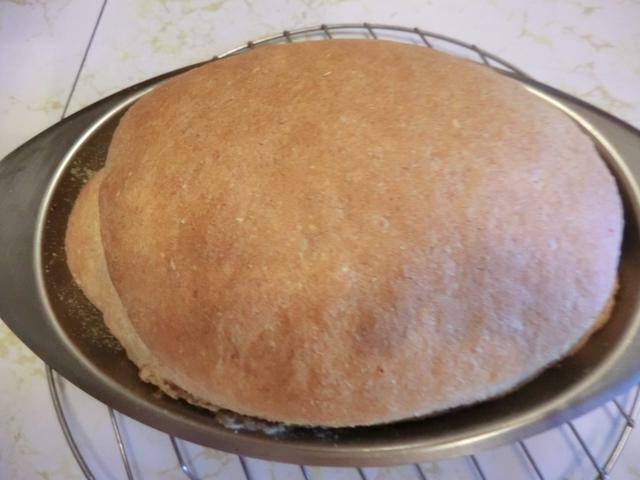 Bake for 30 minutes, take out of pan, and bake for another 5-10 minutes or until the bottom is golden brown and when rapped, the loaf gives a hollow sound. 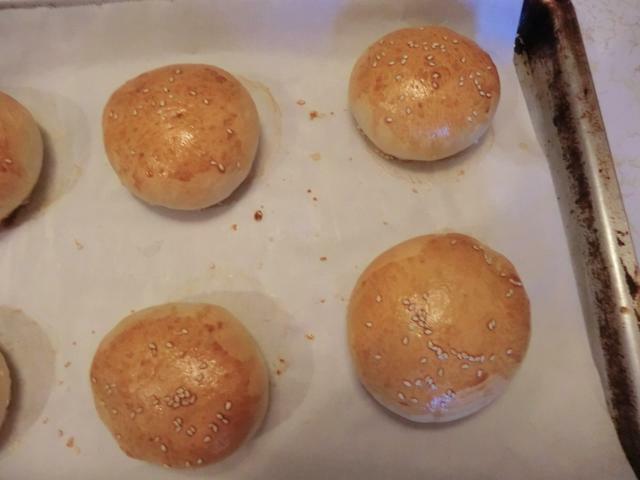 I didn’t get a chance to go to the bakery to pick up some burger buns this weekend, so I decided to make them myself today. 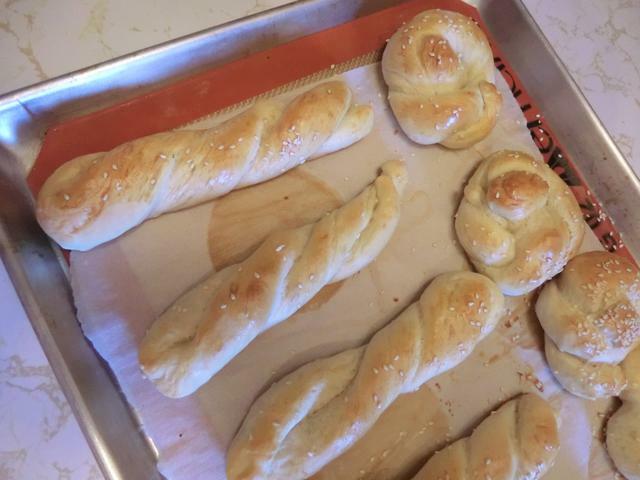 And instead of using a recipe I had already tried, I found a recipe for soft Italian bread sticks that sounded interesting, and used that. 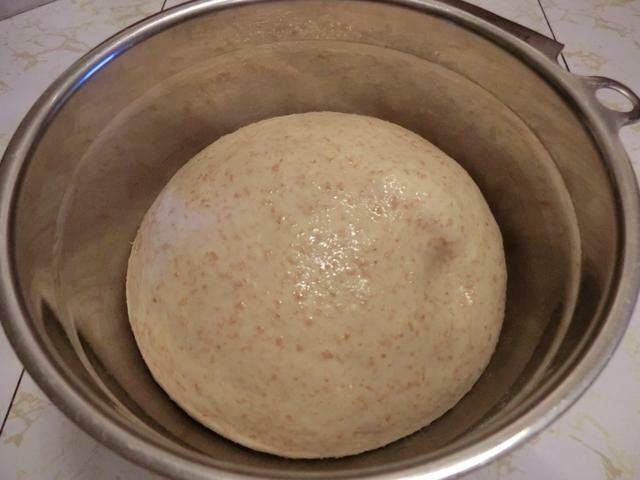 After the major fail of trying to get my new pineapple sourdough starter dough to bulk proof (24 hrs and it didn’t rise much at all), I was going to pitch it but then I decided to keep it going for at least a few weeks and then freeze it until next summer when I have time to play. 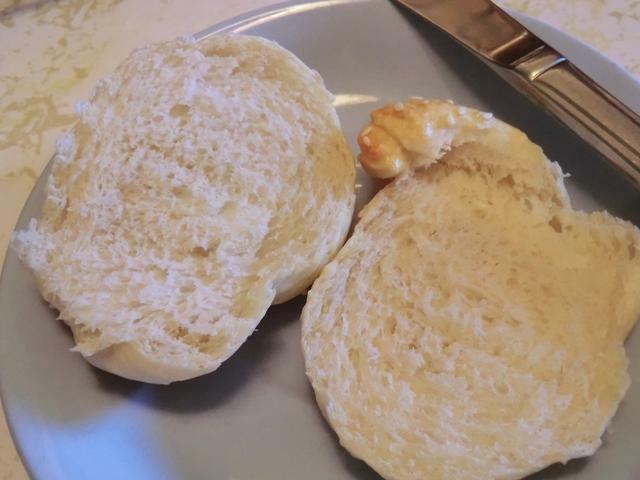 I had about 1/2 a cup or so of discard starter and threw it into the bread stick dough mixture as a flavour enhancer. 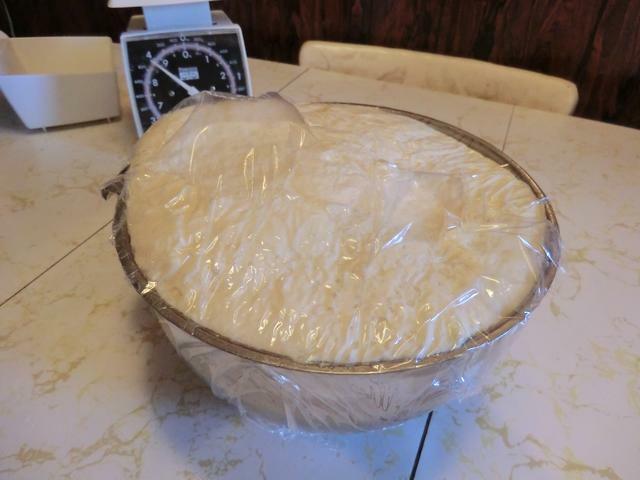 I usually bulk proof my dough in the microwave with a 2 cup pyrex cup full of very hot water and check the rise after 40-45 minutes. 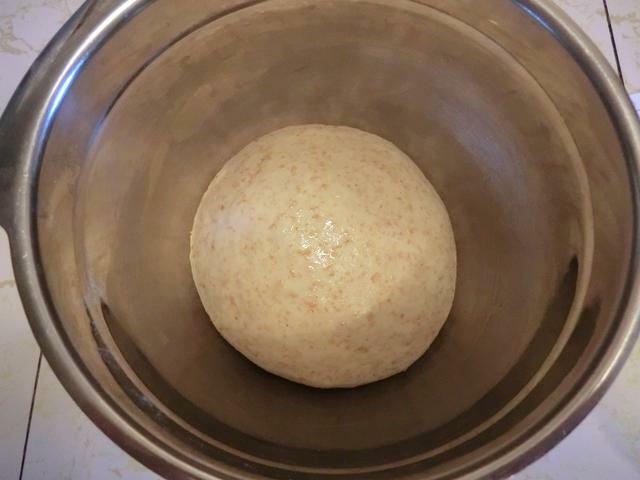 Today, I decided to let it go the full hour and the dough had started to go over the top of the bowl. Luckily, I had a large sheet of plastic wrap tightly covering the bowl or I would have ended up with a mess. 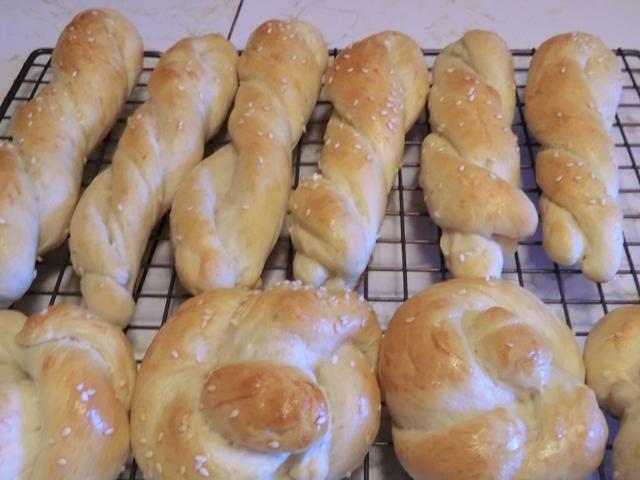 The recipe makes 24 bread sticks but I divided my 2 pounds of dough in half and made a half dozen burger buns with one half and 6 twisted bread sticks and 5 twists with the other half. Some time ago, I made two babkas filled with chocolate chips, Nutella and pecans. I gave away one, but only ate a few slices from the second loaf before freezing away the rest. 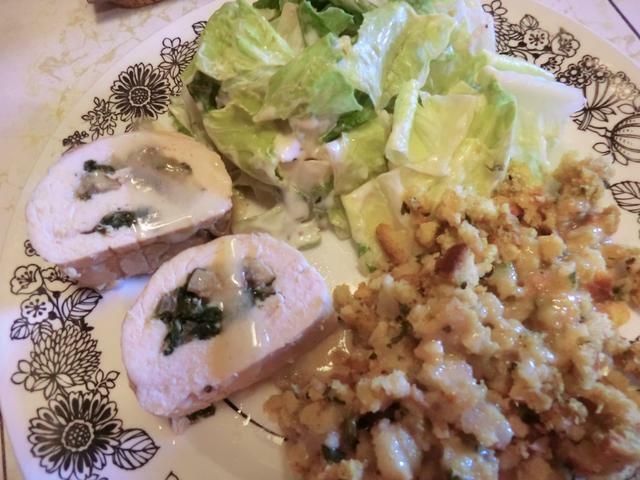 After spending three days on preparing and cooking the turkey for Thanksgiving, I didn’t want to invest more time and energy on a dessert, so I went scrounging through the freezer and pantry, to find out what I had available already. 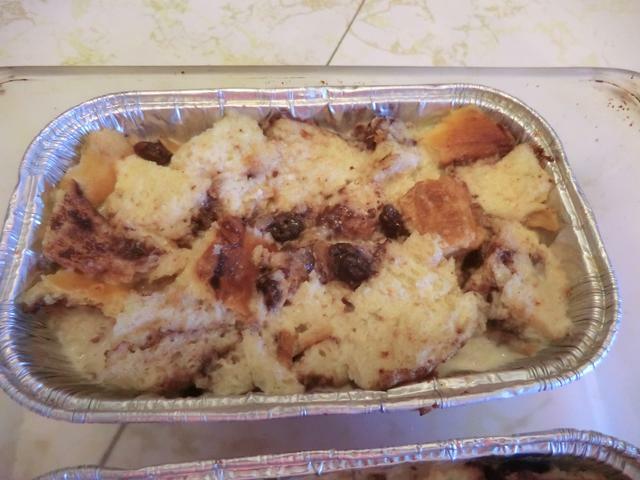 I found the frozen babka and decided to make bread pudding. Instead of making a vanilla custard sauce to serve over the pudding, I warmed up some leftover caramel sauce. 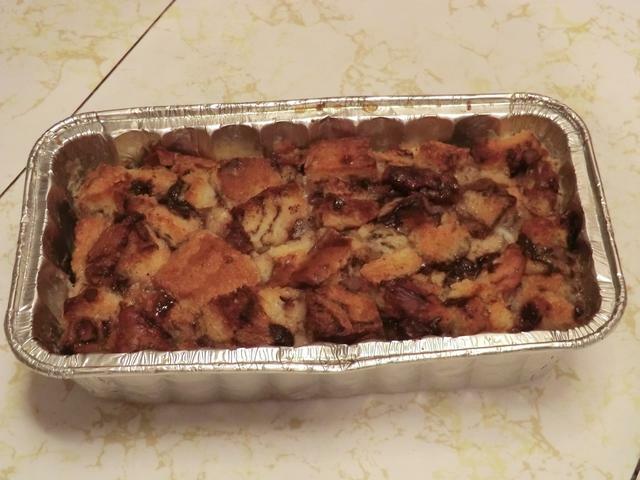 I ended up having enough babka to make two small and one medium bread pudding. Each small pudding served two while the medium pudding was enough for four generous servings. 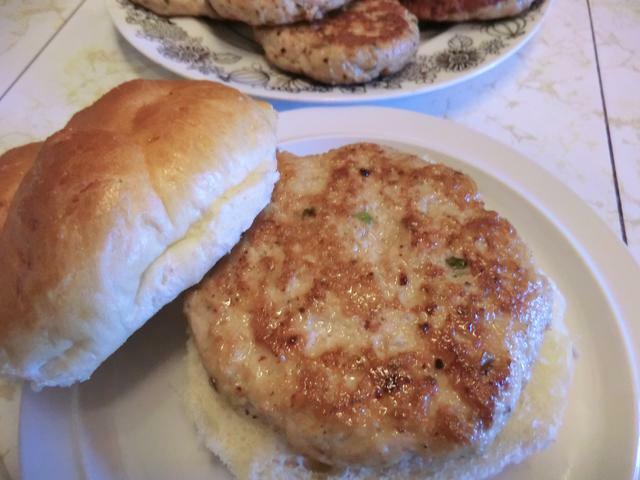 A tasty transformation of leftovers out of the freezer with little effort. Divide up the babka cubes among 2 unbuttered mini aluminum foil pans. Warm up milk, stir in condensed milk, sugar and margarine until the sugar and margarine has dissolved. Let cool in the fridge, then stir in vanilla and eggs and whisk well. 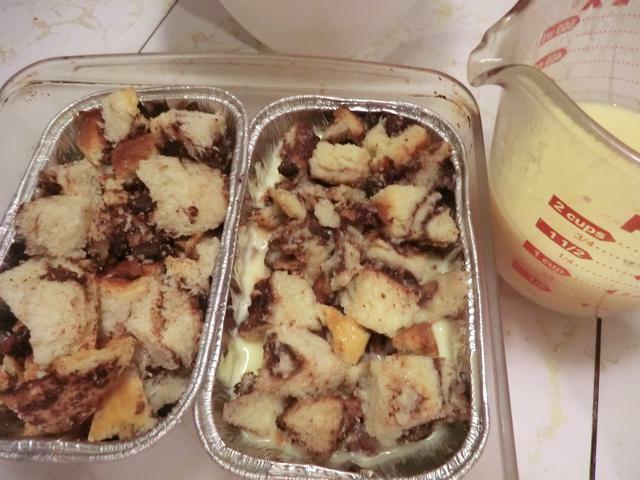 Pour over the bread cubes, cover and let the custard soak into the babka cubes in the fridge overnight. Next day, preheat the oven to 350 deg Fahrenheit. Place the pans in a larger container, fill to about half way up the pans with hot water and bake the puddings for 30-40 min or until the custard is no longer wet in the middle. Slice and serve with ice cream or a vanilla custard sauce. 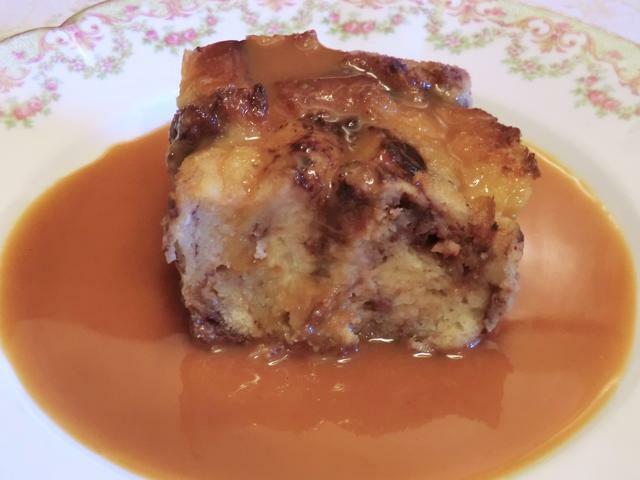 ETA: Although you can use frozen babka to make the bread pudding, I do NOT recommend freezing the finished/leftover bread pudding. 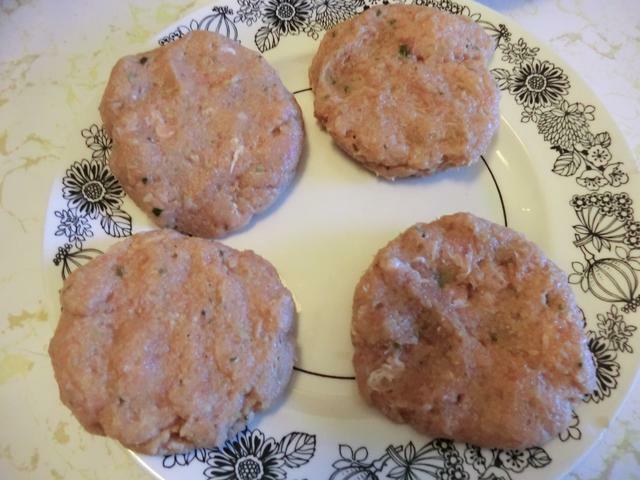 On thawing, it ends up soggy and unappealing. Sorry for the picture overload but I wanted to show how many meals you can get out of one 12 pound turkey … 16 servings of boneless breast meat, 10 turkey patties, at least 2 or 3 turkey mole wraps or whatever you want to do with the drumsticks. And then there’s the turkey stock from the carcass. Oh, and that wingette snack. The best part was that it was only 99 cents a pound. 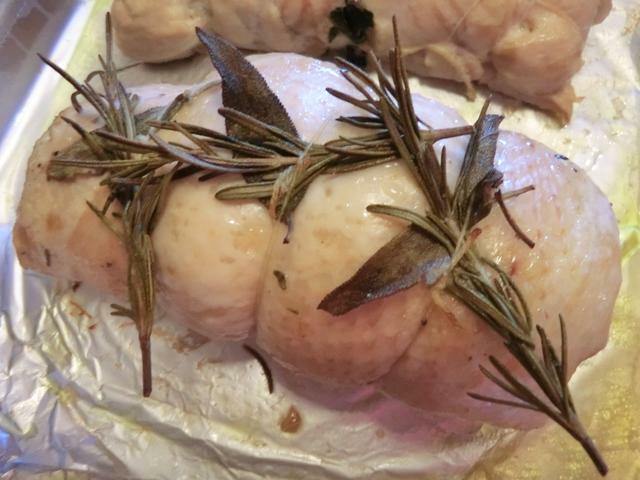 This year’s turkey was a frozen, young male, utility grade and weighed twelve pounds. Tasty and, as always, economical. He’s missing his left wingette and wing tip, which is what makes him utility and not Grade A. 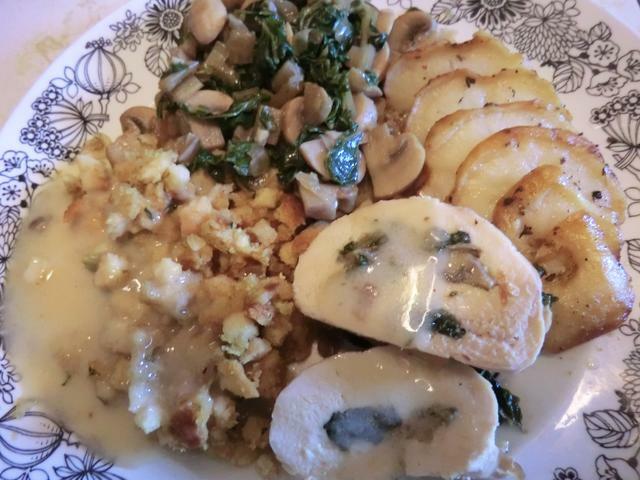 Leftovers – Hassleback potatoes and the rest of the swiss chard and mushrooms stuffing instead of a salad. 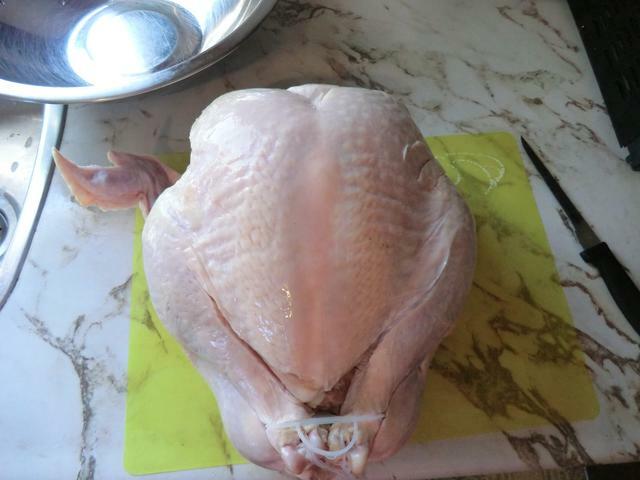 Because I had boned a whole chicken before, I thought I’d be able to bone this turkey too. 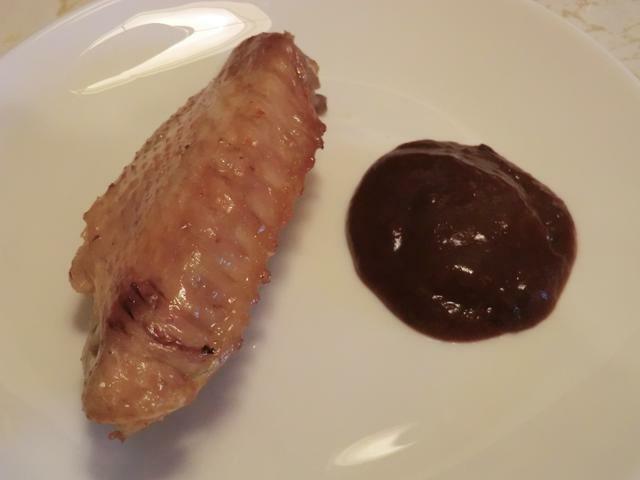 However, I forgot all the tendons and ligaments on the drumsticks (pliers would have helped), and, my less than optimal boning knife had a hard time removing the flesh from the bone. It didn’t help that I decide to try de-boning from the front. I ended up hacking up the skin of the back. 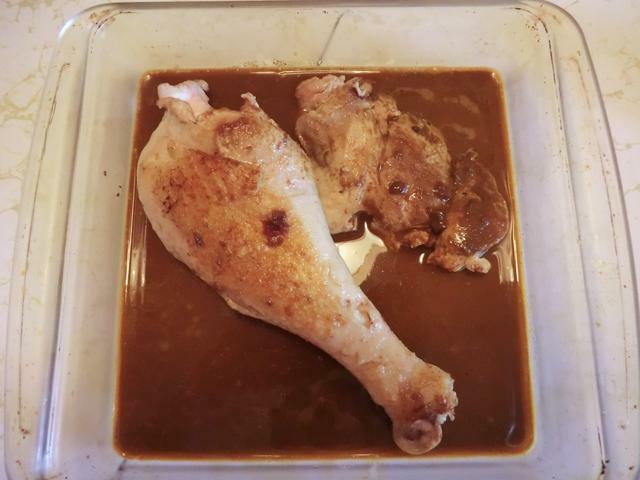 After spending about 15-20 min on one drumstick (the guy in the video I watched did the whole turkey in 20 minutes) I gave up on boning the other drumstick. 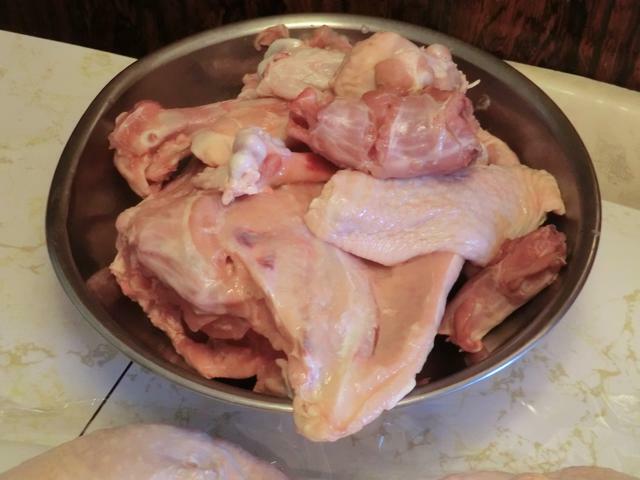 Mostly boned turkey – Those are most of the tendons found in the drumstick, on the blue plate. 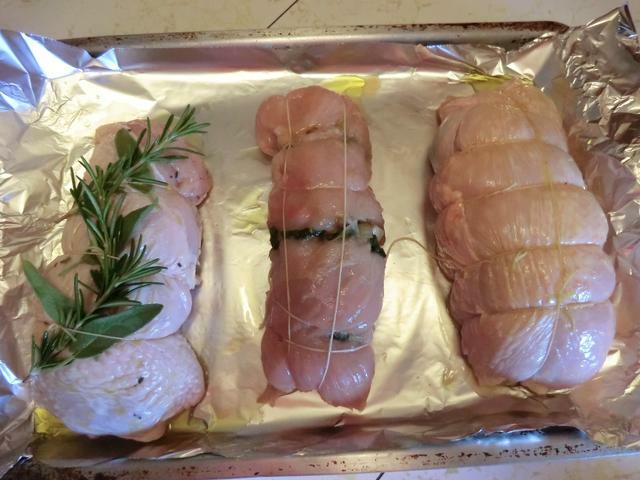 The breast on the left was marinated with garlic, dried sage and rosemary, salt and pepper and lemon zest. 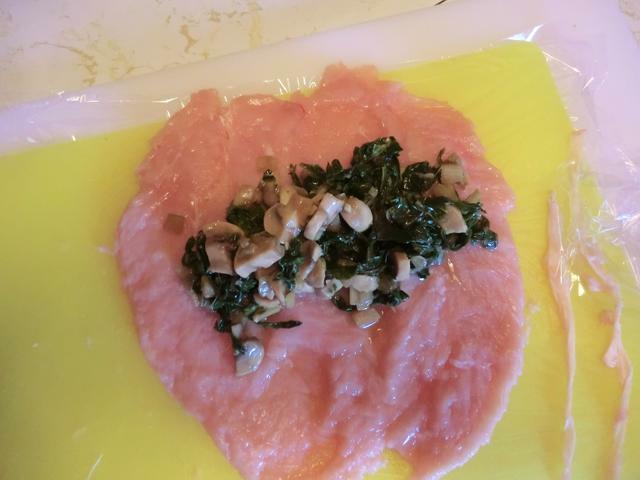 The one on the right was stuffed with sauteed swiss chard, mushroom and diced onions as were the 2 tenderloins (pounded flat first) in the middle. All three were tied and baked at 350 deg F for about an hour. 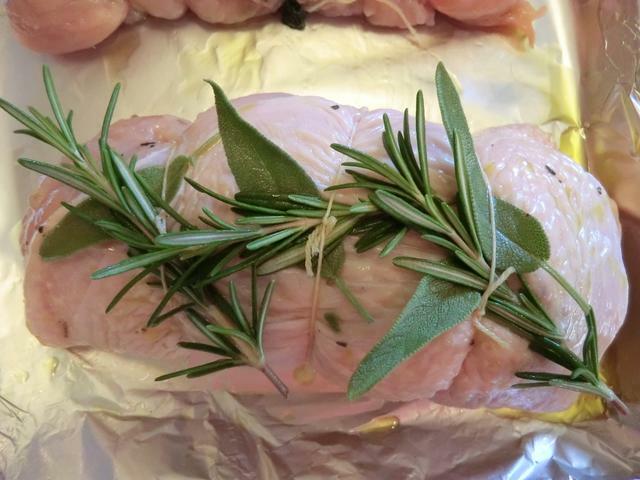 After baking and cooling, the two breasts were wrapped up tightly in saran wrap and foil and frozen away in a large freezer bag. 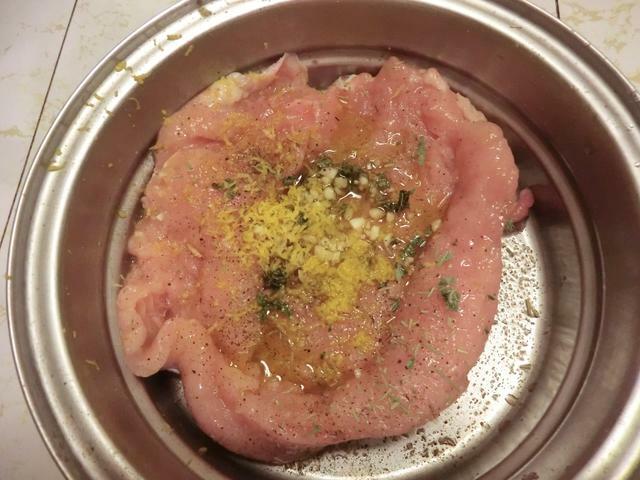 Each one will provide 6 servings of boneless breast meat. The wingette was baked along with the carcass (stored away for stock) and served on Saturday … my reward for that boning job. 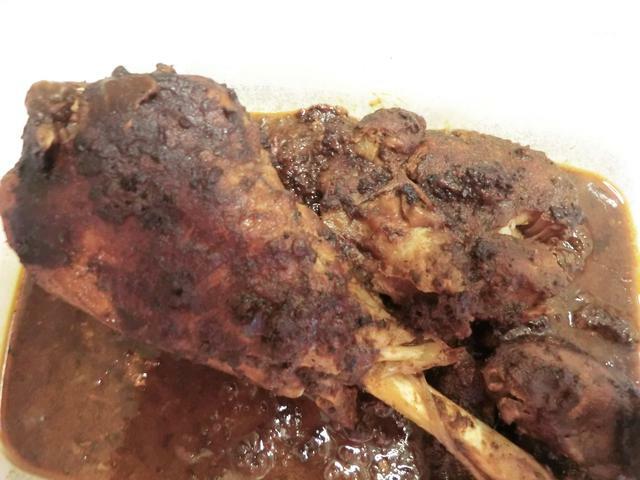 Drumsticks, bone in and mostly boned, seared and then braised in mole sauce. 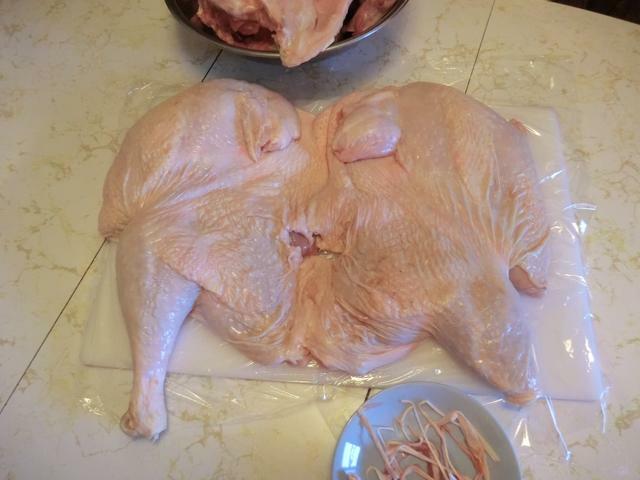 Thighs and some of the white meat (ie drumsticks and breast trimmings) were ground up along with green onions, water chestnuts, an egg, soy sauce, 1/4 cup of seasoned Italian bread crumbs, and salt and pepper before being formed into 10 quarter pound patties. This weekend I stopped in at the new city market and did some browsing. With less than $5 cash in my wallet, all I was looking for was an avocado. They didn’t have any avocados at either the regular or organic garden fruit and vegetable kiosks but they DID have a kiosk with Dutch apple pies etc and one with raw chocolate and fudges. It was early and there weren’t a lot of customers there yet so I struck up a conversation with the owner of the fudge stand. Even though I ‘hinted’ that I wasn’t in a position to buy on THIS visit, she offered to let me try her samples. I stuck with two, chocolate chili and chocolate cherry. 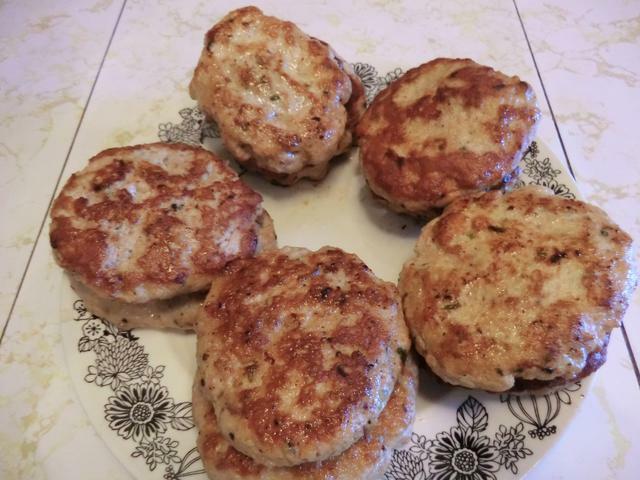 They were ok, but honestly, I’ve had and even made better. I didn’t ask the price per pound/kg but it wasn’t cheap … $8 for the pre-cut and wrapped blocks which I estimate weighed ~150 gm. 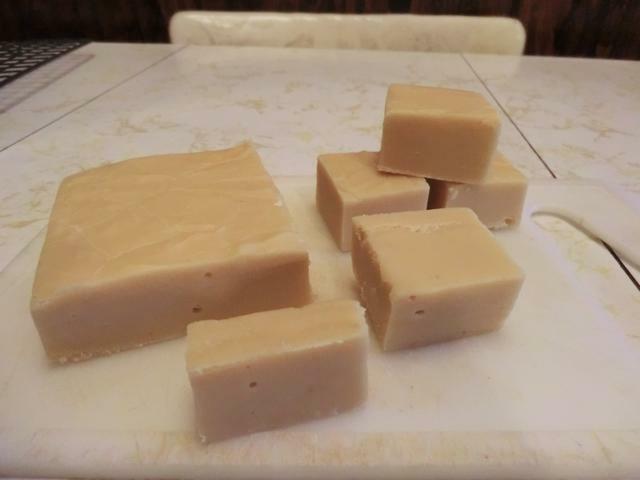 In any case, I got a fudge craving so after a Saturday of watching the dough I had made with a new pineapple sourdough starter not rising, I dug out my recipe for vanilla fudge and made a batch. 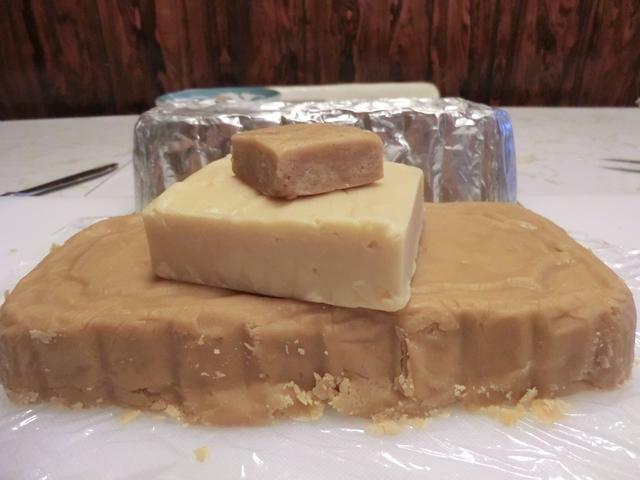 I haven’t made fudge for over three years, so I was a bit nervous about the process. One thing you NEED when making fudge is an accurate candy thermometer. Mine claims water boils at 87 deg C/188.6 deg F so I use the soft ball test. I may have jumped the gun ‘just a bit’ when I took it off the heat and started cooling and then beating, but it looked good when I let it cool overnight. And the remnants of the fudge left on the pot tasted very good. 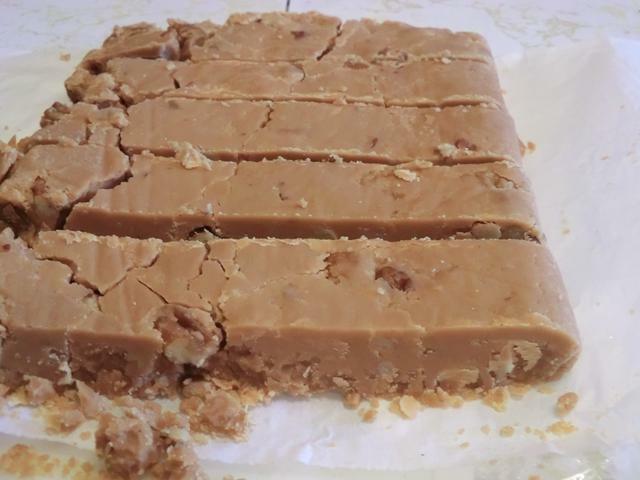 This morning, I dug the slightly soft vanilla fudge out of the aluminum pan I had poured it into, and threw it in the fridge for a half hour or so cause I wanted to get a nice clean cut. Perfection … melt in your mouth, creamy smooth and delicious. Put the milk, sugar and butter in a heavy-bottomed saucepan. Heat slowly, stirring all the time, until the sugar has dissolved and the butter melted. Bring to the boil and boil for 20-25 minutes, stirring all the time. Leave the mixture to cool for 5 minutes in the pan. Beat the mixture with a wooden spoon for 5-10 minutes until the fudge starts to thicken and the gloss disappears. 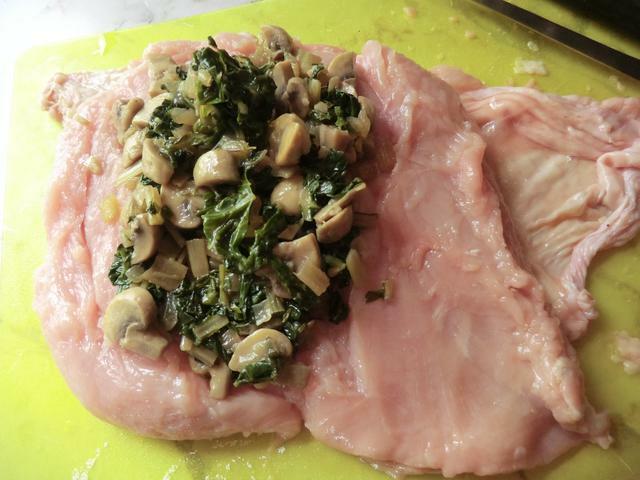 Pour into a prepared pan and leave to set at room temperature (do not put it in the fridge). Once set, cut the fudge into small squares and store in a sealed container. Maple Pecan Variation: Replace the white sugar with brown sugar and add 3 tbsp of maple syrup. Stir in 1/2 cup coarsely chopped pecans at the same time you add your vanilla. Of course, I pushed the limit and made a batch of maple pecan fudge too. I over-cooked it cause I kept cooking past the soft ball to the soft crack and then I transferred the fudge (the butter was separating as I stirred) into a large metal bowl where it started to get all crumbly. I scraped the fudge into my prepared pan, and learned it was too big for the amount of fudge I had. 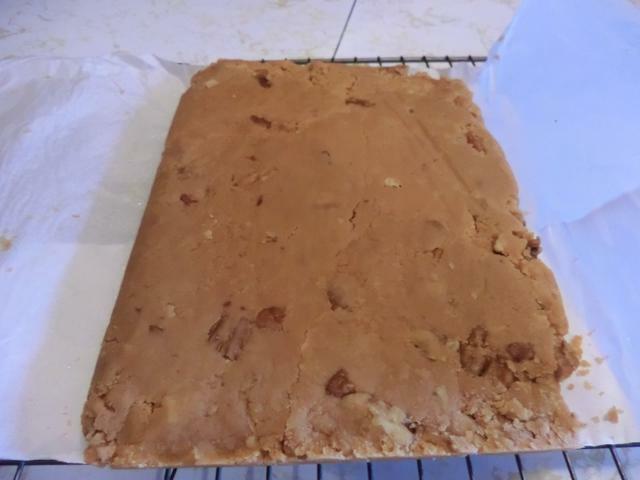 So, I shaped the fudge into a rough rectangle using the parchment paper and let it cool. The crumbly bits aren’t grainy in your mouth, though, and are tasty as well. Fudge at start and towards the end of the cooking when you want to start your soft ball test. Lesson Learned: Even a less than perfect fudge is delicious. 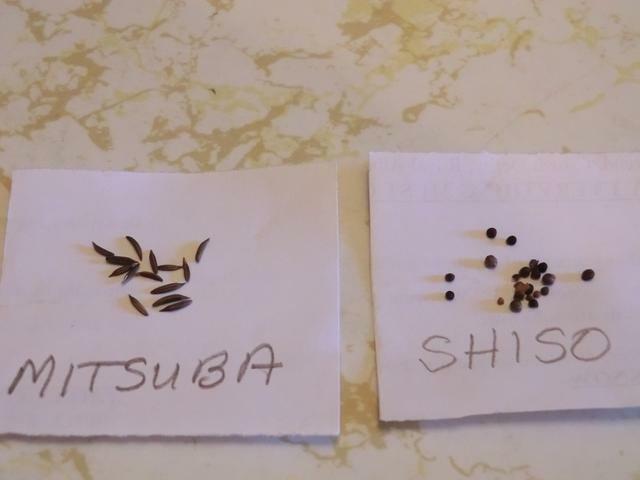 This post features my first attempts to germinate shiso and mitsuba seeds … the timing isn’t the best but I think I learned a lot for next spring. As a fan of Japanese dishes, especially sushi, I’ve heard of shiso, also known as perilla, and its various uses in both its green and red forms. Most simply the green version can be included in hand rolls or as an edible garnish under sashimi. The red form is most famously used for coloring pickled plum, or umeboshi. I happened to whine express my culinary interest in acquiring some in correspondence with a blogging Swiss friend and she offered to send me some seeds from her plants. I emailed her my snail mail addy, and as it was almost the end of summer, thought I’d have something to look forward to in the spring. I was pleasantly surprised to find an envelope in the mail in almost no time as well as detailed growing instructions and the assurance that more seeds would come for spring planting. So, with nothing to lose, I gave it a shot. The shiso seeds are small and round, similar to basil seeds in size. 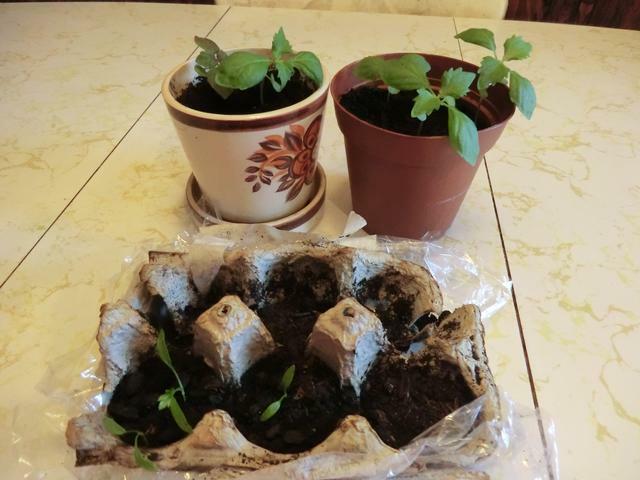 And like with basil seeds, you get the first embryonic leaves peeking through a light covering of soil about 4-5 days after planting. 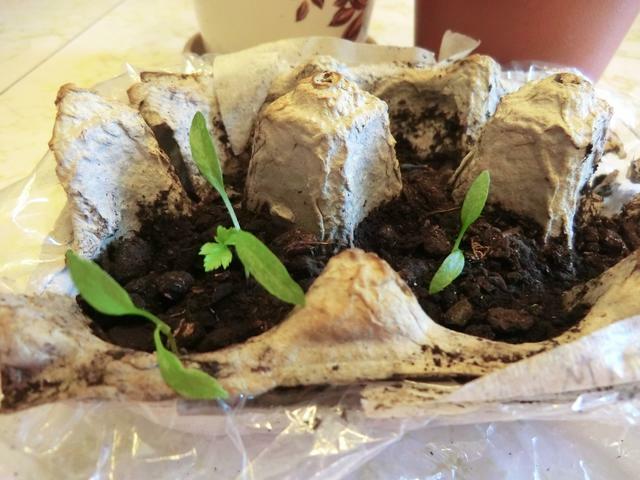 Wait until the first TRUE leaves appear and the stalk is about an inch in height before thinning and transplanting the seedlings into larger pots. 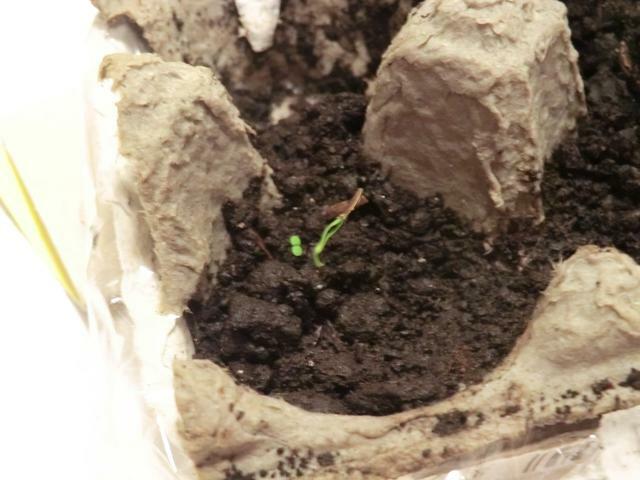 I planted 10 seeds and got 5 germinating. 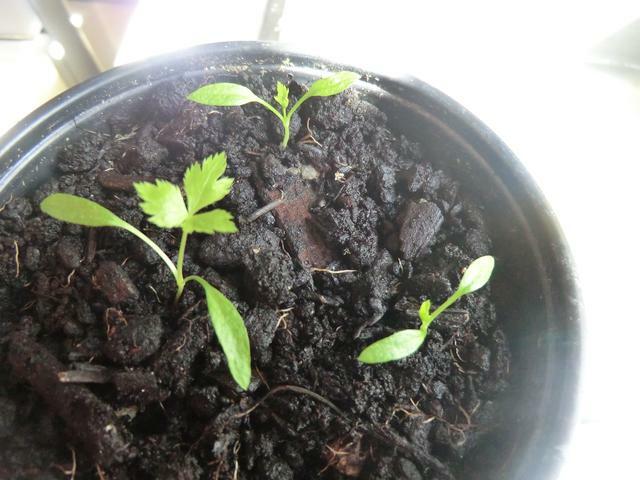 Shiso seeds were planted in the back row … you can see the first 3 seedlings. D-shaped embryonic leaves with more normal oval shaped leaves in the middle. 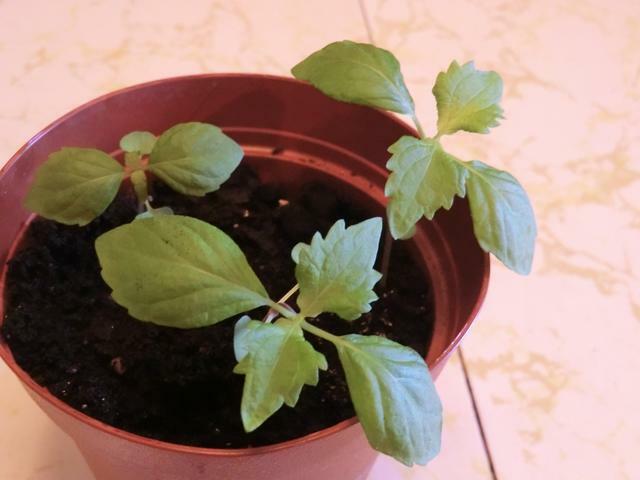 Shiso leaves have their 2nd and 3rd set of ‘true’ leaves. Only one of the mitsuba seedling has its first set of ‘true’ leaves. 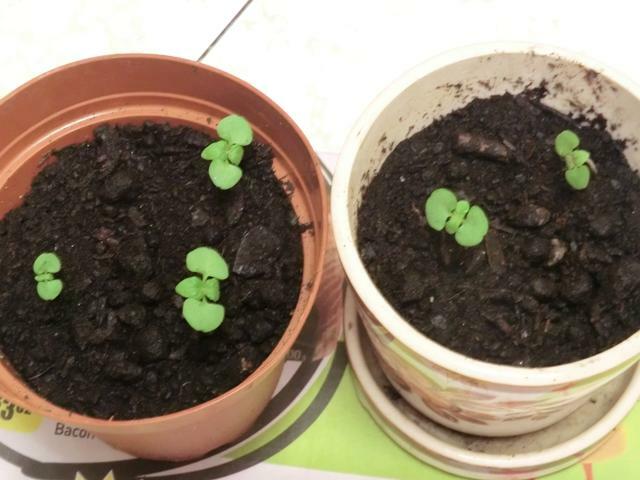 They were planted at the same time. Also included in the package were seeds for mitsuba, also known as Japanese parsley, which is said to have a celery like flavour with a number of uses, including as a garnish in soups and as a sushi ingredient. Mitsuba seeds are long, thin and black, similar to cumin seeds. I attempted to germinate about 10-12 seeds but only 3 sprouted. The embryonic leaves reminded me of leaves of grass so I wondered if I had actually managed to sprout one when the first hint of green peeked through the soil. Only the husk of the seed coat, which was still attached let me know I had succeeded. 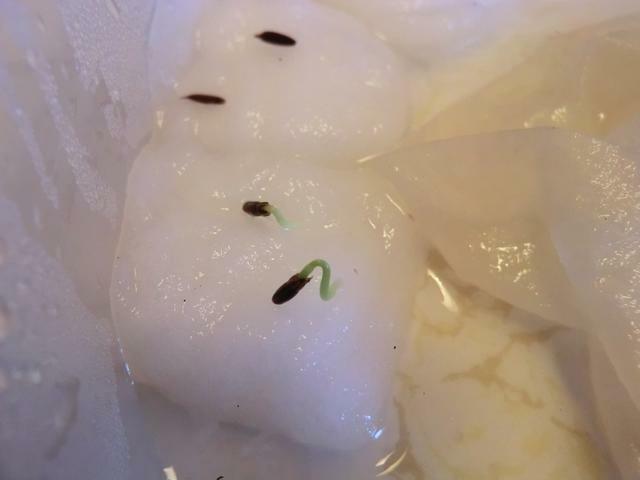 At first I thought only one seed had germinated but over the course of the next 10 days, a second and then finally a third sprout was seen. It took almost 3 weeks for the first ‘true’ leaf to appear. And even longer before I felt confident enough to transplant them into pots. Parsley like ‘true’ leaves. 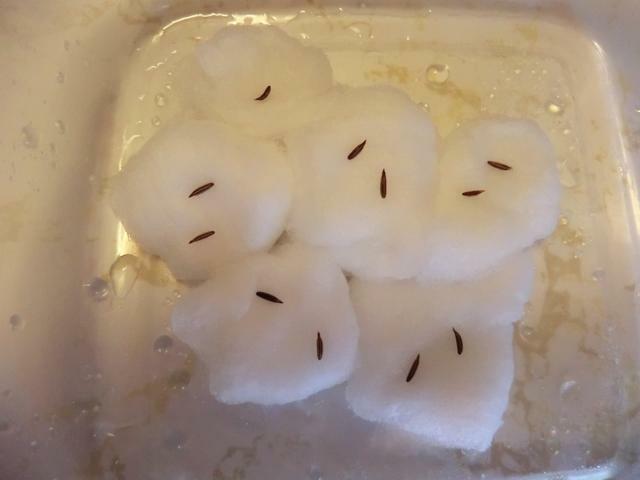 ETA: 10/10/2016 Since I was having so much trouble with the mitsuba germination, I tried a method suggested by the friend who sent me the seeds to germinate the shiso – on damp cottonballs misted with water daily after 2 days of refrigerating. 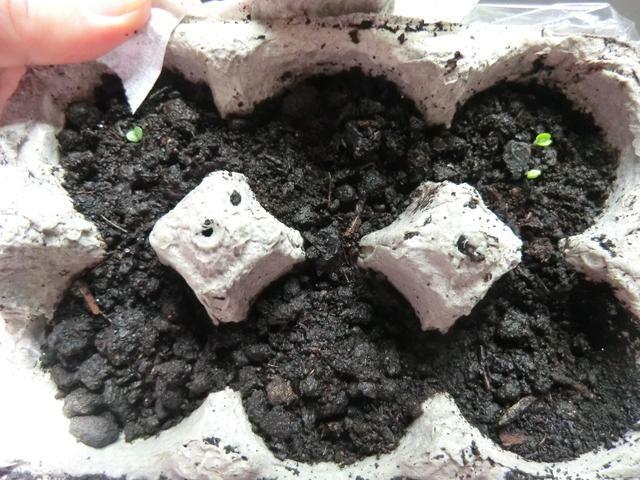 It took a bit over 3 weeks but 2 out of the 11 seeds germinated… so far. 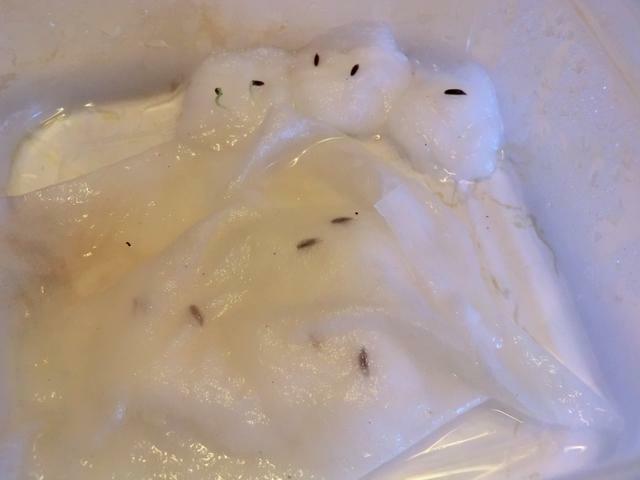 I covered 6 of the seeds with a damp paper towel as well, as a test.